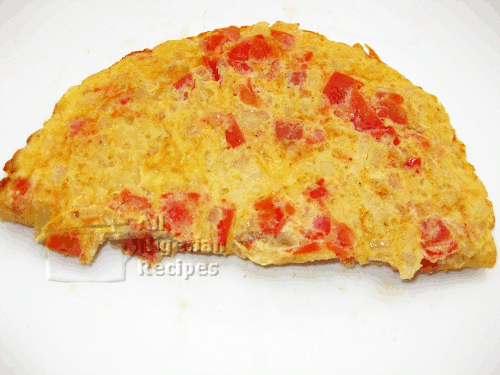 Tomato Omelette is one of those recipes that I overlooked thinking that it is so easy to make that everybody will be able to make some. How wrong I was because this is one of the most requested recipes by the visitors to this website. Flo, please show us how you make your Tomato Omelette? Flo pls can you show us how you flip your Tomato Omelette so that it does not scatter? Flo please can you make a video of that reddish fried egg? I usually go with the ratio of 1 egg to 1 plum tomato but you can use 2 eggs to 1 tomato if you want. If you decide to go with the latter please note that you may not be able to fry it in one go as I did in the video below. You can also use vegetable oil instead of butter when frying the tomato omelette. A bit of ground pepper helps curb nausea that some people get when eating fried egg. Cut the tomato into small pieces. I prefer to remove the seeds. Cut the onion into small pieces. The onions should be the same quantity as the tomato (after cutting them). Beat the egg, add a pinch of salt and the ground dry pepper if you are using this, stir well and set aside. Melt half of the piece of butter and add the onions. Fry for a few seconds and add the tomato. Fry till they are well heated up, this should take a maximum of 5 minutes on medium heat. Pour this into the egg. Mix well and add more salt if necessary. Set the frying pan back on the stove and melt the other half of the butter. Once the butter melts, slowly pour the egg and tomato mix making sure that it is evenly distributed in the frying pan. Turn the heat down to low. On a scale of 1 to 10, the heat should be at 4. Wait till you see the tomato omelette caking. Once the heat is low, it will not burn so you need not worry. Also, using a non-stick frying pan helps ensure that your tomato omelette will not burn. Once it has caked considerably, shake the frying pan and the omelette moves on its own. If it doesn't then it is either the heat is too much or the inside of your frying pan is too rough or both. Gently transfer the omelette to a very flat wide plate. This step is best seen so watch the video below to see how I did that. Cover the omelette in the plate with the frying pan and flip is such that the top side is now at the bottom of the frying pan. Again, see the video for how I did that. Set the frying pan back on the stove and fry till the bottom side is well fried. Once it cakes, it's ready!